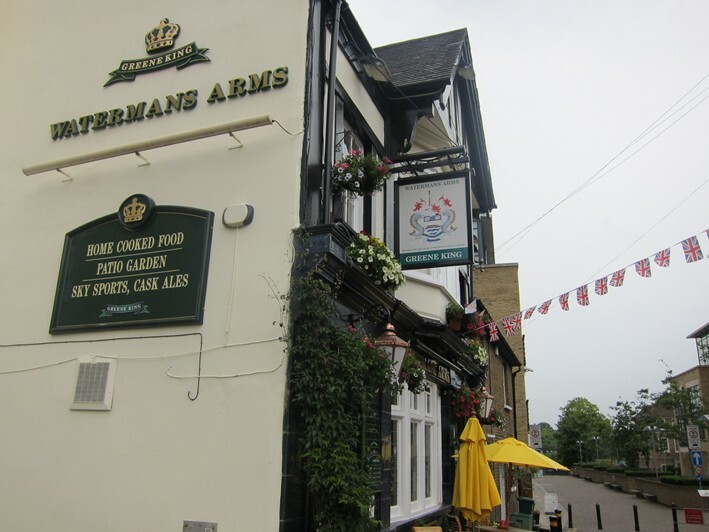 The Watermans Arms is an old boozer that has recently been refurbished, but is still firmly a pub rather than a designer gastropub. It is very near the river in Brentford, though it does not have a river view. What sets it apart is that its chef/owner, Gordon Fry, lived for many years in Asia (he has a Japanese wife, Mariko), and the menu mixes pub fare with Japanese dishes. The pub itself is quite small and sparsely decorated, with a wooden floor and cream walls, with the bar in front of you as you come in and a few dining tables behind that. Lighting is rather gloomy, hence the matching photos; there is complimentary wi-fi, which is a nice touch. There is also a little garden patio on which one can sit out on clement evenings. A few specials are up on the blackboard, and the menu has fish and chips and the like alongside a few Japanese dishes; a much more extensive Japanese menu is available if pre-ordered, at £19.95 for a set menu. 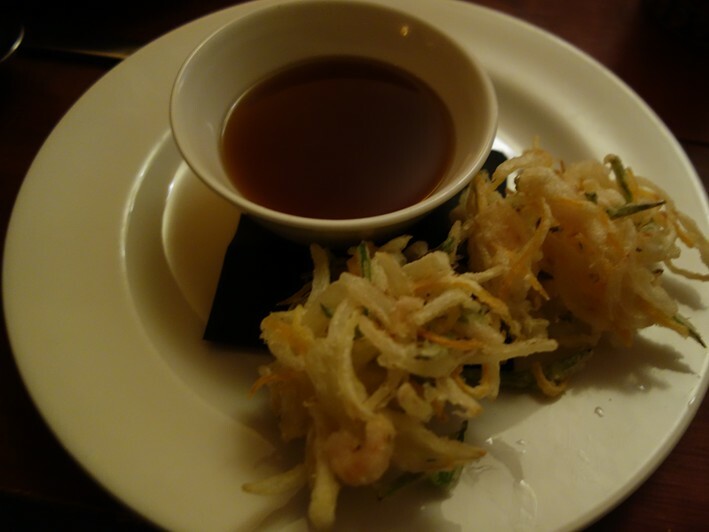 At a May 2014 meal, kakiage (tempura of prawns and shredded vegetables) was comforting and very pleasant, served with a good soy dipping sauce (12/20). Soba noodles with tiger prawns were very enjoyable, the prawns tender, the noodles having good texture and the dish having a nice chilli bite (easily 13/20). Desserts are a bit of an afterthought at present. An almond and pear tart was bought in and harmless enough. In due course the chef hopes to make his own desserts. The bill came to £26 a head. The chef works single-handed in the kitchen, and the bar staff are friendly and helpful. This is not fine dining by a long way, but the food is made with passion and the value for money is undeniable. Specials vary daily, such as a good short rib of beef glazed with chilli sauce at a June 2013 meal. At this meal a starter of tempura prawns and vegetables was pleasant, though the tempura batter was not the lightest that could be imagined (11/20). 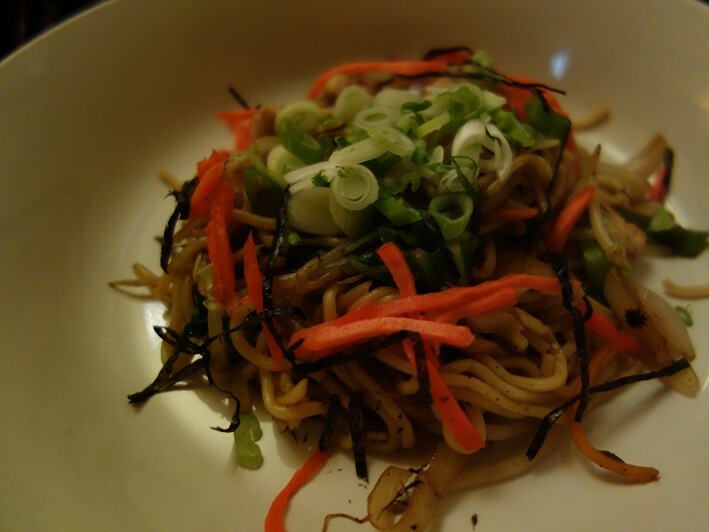 Better was a dish of stir-fried soba noodles with chicken and vegetables, the noodles having good texture and the chicken and vegetables properly cooked (12/20). 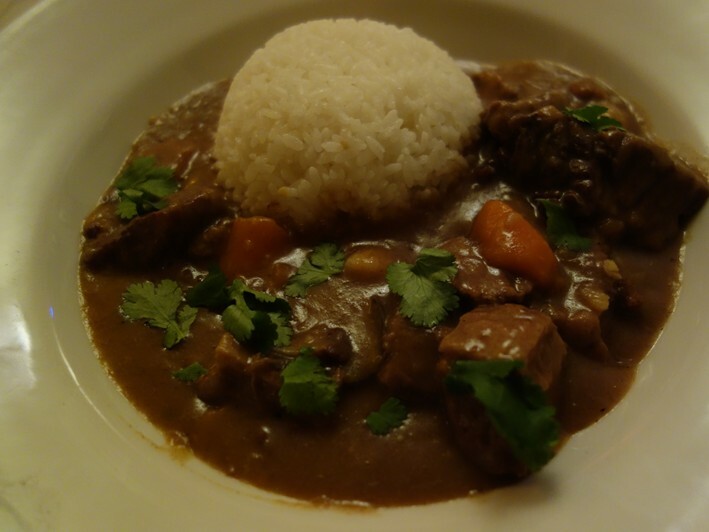 Japanese beef curry used slow-cooked brisket, which was quite tender, though the spicy kick was rather underwhelming; a Japanese spice block is used here, but I wonder whether for a western palate some extra punch would be beneficial (11/20). 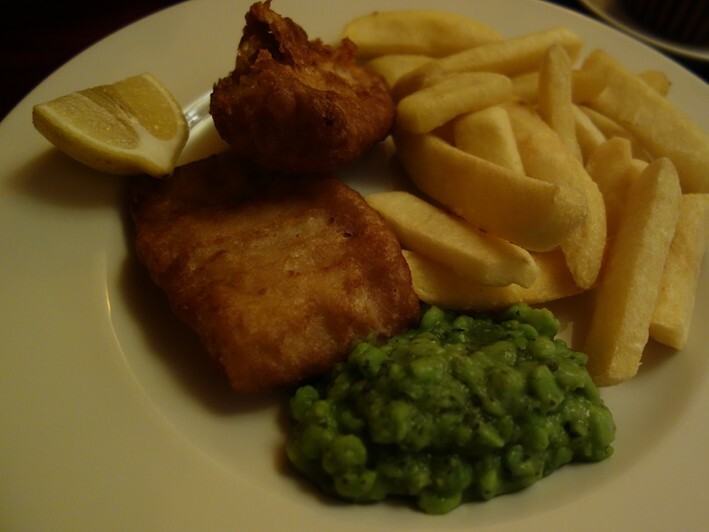 Haddock and chips were good, with well-made crisp batter (12/20). At the end there was a homemade almond cake with homemade orange marmalade. The sponge was a little soggy, but the marmalade was excellent, with just the right amount of bitterness (12/20 overall). The bill for all this, including plenty of drinks, was just £21 a head, which represents excellent value in my book. The notes below were from a meal in June 2012. 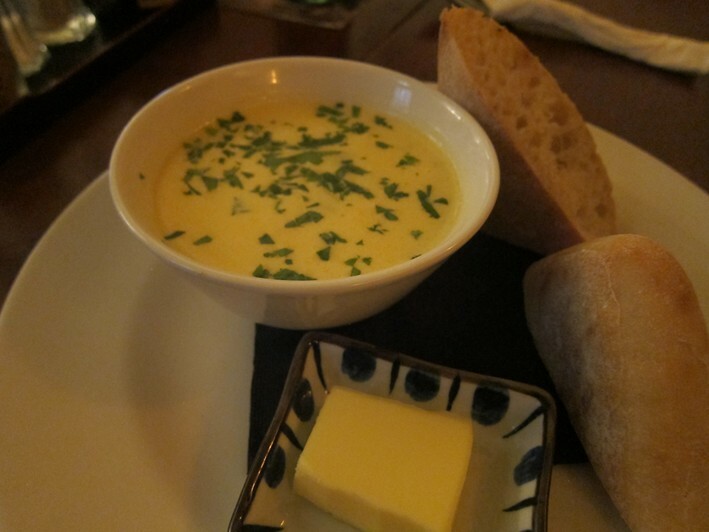 Haddock chowder (£4.50) had reasonable flavour and was nicely seasoned, served with warm bread (12/20). 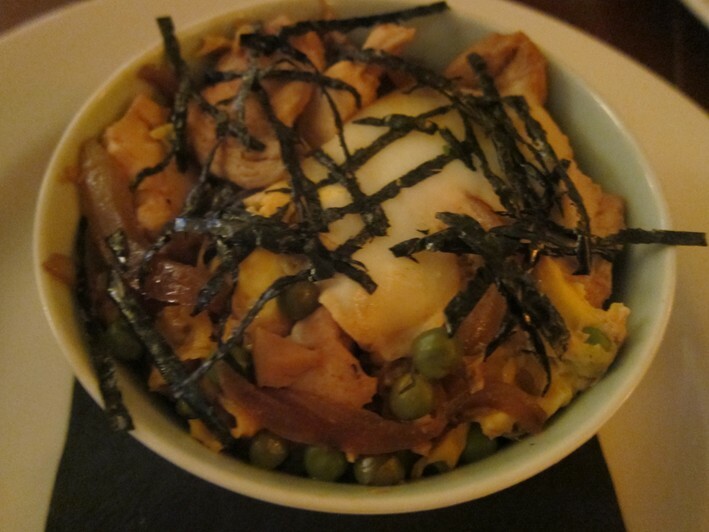 Oyako donburi (£4.95) is a rice bowl dish with chicken and an egg (the name actually means parent and child, referencing the chicken and the egg) and is a comforting peasant dish. Chicken pieces are cooked with dashi, mirin, soy, peas and spring onions in a skillet, the egg added towards the end for a few minutes, so that it is lightly set. This was very enjoyable, the chicken nicely cooked, the balance of the dish good (13/20). Salmon fish cakes (£9.95) with chilli and leek were decent, though rather thin, so there was a lot of coating relative to fish filling (12/20). 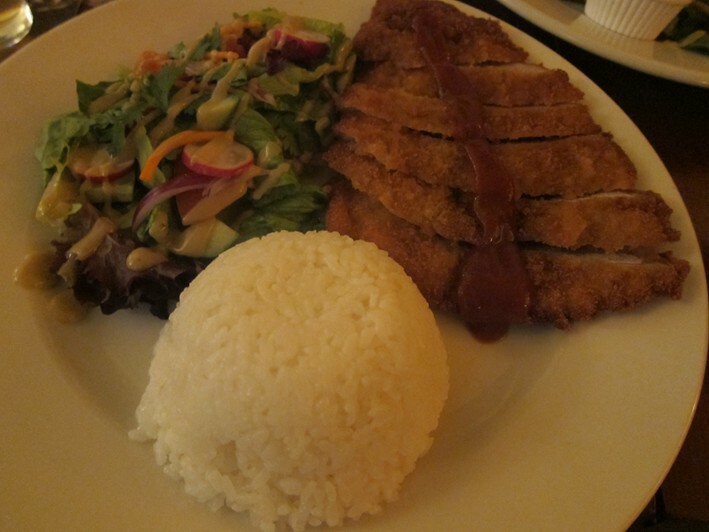 Tonkatsu (£9.25) is a popular dish in Japan, though ironically it was introduced to Japan in the 19th century, probably by the Portugese; “ton” means pork and “katsu” means fried. 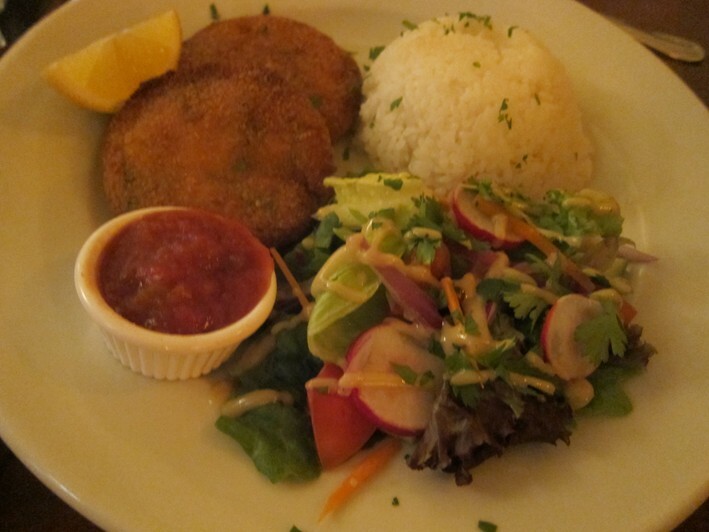 This dish is a cutlet of breaded deep-fried pork, served in this case with salad, rather than the traditional shredded cabbage, and rice. The salad was crisp and had a little radish, so had a hint at least of Japan, while the pork itself was pleasant, though it needed more of the tonkatsu chilli and sesame sauce, as the overall effect was a little dry (12/20). Desserts are mostly bought in, so I did not bother with this course. The bill for two courses with beer came to an extremely reasonable £18 a head. Service was basic but friendly, and the chef is an engaging individual who clearly loved his time in Japan and was happy to chat about this before the dining room became busy. 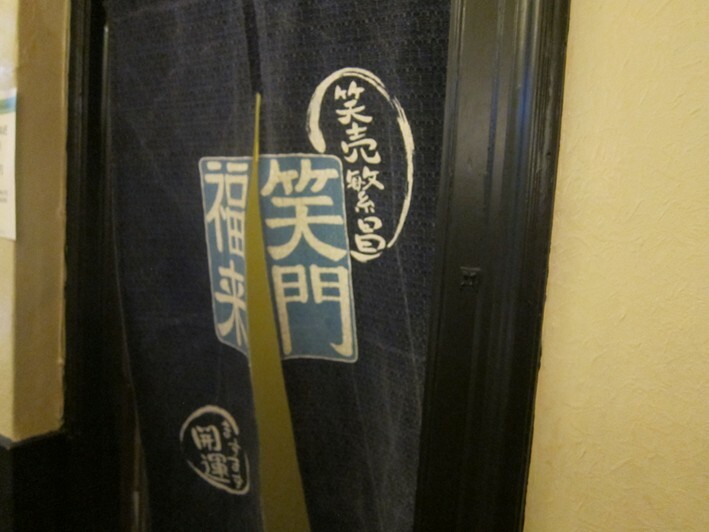 This is not ambitious cooking, but it is a cut above the pub norm, and the Japanese dishes were capably made. A very enjoyable and good value meal.